Print advertising sales for newspapers appear to be on track to plunge by $2 billion this year, which would make for the worst performance in a decade other than the disastrous period following 9/11. The difference between this projected decline and the one after September, 2001, is that it would occur in an era of economic well being characterized by low unemployment, respectable retail sales (until this nasty April) and record highs in the stock market. The setback, if it materializes, would be unprecedented for an industry that, until recently, has been masterful at increasing its revenues in good times and bad. The potentially abrupt reversal of fortune would be caused not merely by competition from the Internet but also by profound changes in the way consumers buy and marketers sell. We’ll come back to that in a moment, but, first, the numbers. Based on the industry’s dismal 6.4% drop in print ad sales in the first quarter of the year – including a staggering 13.2% decline in classified revenues – publishers will be lucky to break $44.5 billion in print advertising in 2007, according to projections based on statistics reported by the Newspaper Association of America. That’s 4.6% less than the $46.6 billion in print sales in 2006, when sales were 1.7% lower than those of the prior year. My forecast is based on a model that follows the industry’s remarkably consistent pattern over the years of producing 23% of its annual revenues in the first quarter and generating 25%, 24% and 28% of yearly sales in each succeeding quarter. If any of these periods performs better or worse than the historic trends, then the forecast would be affected accordingly. The second quarter, for example, got off to a rocky start when several publishers reported steep sales setbacks in April. The worst of them were ad revenue declines of 10.3% at Tribune Co., 7.6% at McClatchy, 7.6% at Journal Register and 7.2% at Media General. The best of them, Gannett and Lee, reported respective declines of 3.1% and 3.5%. Assuming print ad sales indeed end this year in the neighborhood of $44.5 billion, they would be only marginally better than the results achieved during the traumatic period following the terror attacks in September, 2001. Total industry revenues were respectively $44.3 billion and $44.1 billion in 2001 and 2002. Because the NAA did not begin reporting online revenues until 2004, there are no precise numbers for print-only sales for any earlier years. But standalone print sales would not have been appreciably lower than $44 billion in 2001-2, because publishers, who generally had little faith in the Internet back then, mostly gave away online ads to sweeten print contracts. Until the shock to the global economy caused by 9/11, the last time newspaper revenues were below $44 billion was in 1998. The big difference between 1998 and now, of course, is the emergence of the digital media as major new competitors for advertising dollars. Online advertising revenues among all players climbed from just $1.9 billion in 1998 to $16.7 billion in 2006, according to the annual survey conducted by PriceWaterhouseCoopers for the Internet Advertising Bureau, an industry-financed organization. Assuming a 25% growth rate this year, online ad sales would total approximately $21 billion for all media in 2007, or nearly half the $44.5 billion in print sales that appear to be in prospect for newspapers. In addition to print ads, newspapers are lkely to sell approximately $3.3 billion in online advertising this year (vs. $2.7 billion in 2006), which would bring newspaper industry ad sales in both categories to a bit less than $48.8 billion, a 3.1% decline from 2006. Before the Internet turned from being a minor nuisance to the disruptive market force it is today, newspaper sales climbed smoothly year after year in the 1990s, unfazed by the ebbs and flows in the economy. 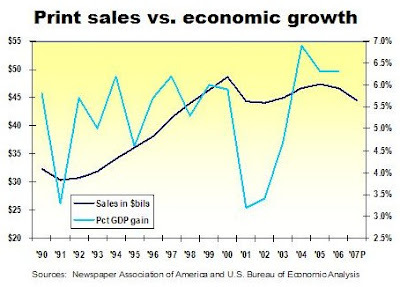 The phenomenon is illustrated in the chart below, where newspaper ad sales are shown in the dark blue line and annual changes of the gross domestic product are depicted in light blue. When the Bubble burst after the banner advertising sales year of 2000, both the economy and newspaper revevnues plunged. But newspaper ad sales still remained more resilient than the economy through both the post-Bubble recession and the aftermath of 9/11. The story changed abruptly in 2005, when newspaper ad sales – for the first time in modern history – began to fall in a period of robust economic expansion. The drop, of course, coincides with the stupendous growth of Internet advertising, which doubled from a post-Bubble low of $6 billion in 2002 to $12.5 billion in 2005. Although publishers put considerable sums of cash into new media initiatives over the last 12 years, they did foolish things like putting the entire contents of their papers on line for free, instead of developing digitally savvy products. As publishers dithered, companies like Google solved the search problem, MarketWatch created a financial portal, MySpace comandeered social networking and YouTube perfected the fine art of viral video. Even though newspapers got more serious – and slightly more sophisticated – about the digital media in the post-9/11 period, new media sales of $2. 7 billion still represented only 5% the industry’s total ad revenues in 2006. Starting with such a small base, even annual digital sales growth at the recent unsustainable levels of 25% to 35% cannot fill the gap that would be left by a continuing series of drops in print-ad revenues. In retrospect, it is clear that newspaper publishers were lulled into complacence in the early years of the Internet by their prior skill in achieving consistent sales growth in even negative economic conditions. But the growth was not achieved as much by recruiting new customers – or even selling more advertising to existing ones – as by using their monopoly-like positions to force hefty annual rate increases on advertisers who essentially had nowhere else to go. That changed abruptly when the online interlopers showed up with not only cheaper ads, but also ones whose audience could be tightly targeted and whose performance could be empirically verified. Automotive advertising is an example of dislocation caused not just by competing media but also by fundamental changes in behavior on the part of consumers and marketers alike. As forecast previously here, auto classified tumbled 12.8% to $3.99 billion last year, the first time since 1996 that this category fell below $4 billion. Classified auto advertising in newspapers, which slid 20.1% in the first quarter to $751 million, has become less relevant now that more than two-thirds of auto buyers spend five or more hours shopping for cars on the Internet, including considerable time at specialized auto sites and those of car manufacturers. Having failed to get ahead of the radical changes wrought by the new technologies, publishers today now face multiple, contradictory challenges as they attempt to reclaim something approximating their traditional levels of sales and profitability. With print advertising volume falling and rates under pressure from lower-cost competitors, publishers are scrambling to cut creative deals to shore up the performance of the product that generates 90% to 95% of their sales. At the same time, they must invest aggressively in new print and digital products to reinvigorate their eroding franchises and position them for future growth. Also at the same time, they are under pressure to preserve their traditional profitability – an especially high priority for publicly held companies. Most publishers have responded to these inherently incompatible demands by making drastic cuts in staff, coverage and news hole. Unfortunately, this degrades the product that generates the overwhelming proportion of their revenues. Publishers may get away with short-changing loyal newspaper readers for a time, if they can successfully reposition their businesses, rapidly recover their profitability and use some of the new earnings to refurbish their tattered core products. Failure to do so, however, may irretreivably damage a business that once seemed so preternaturally invulnerable. The Wall Street Journal should hire independent journalists to cover the drama surrounding the controlling family’s response to News Corp.’s offer to buy Dow Jones. After the distinguished financial newspaper of record initially was embarrassed by its editor’s decision to sit on the story of the $5 billion overture, a certain disconcerting level of spin now appears to have crept into the Journal’s ongoing coverage of the deal. To ensure its credibility is up to the high standards the newspaper’s staff is trying to protect, the Journal ought to engage qualified independent journalists to cover the story, rather than continue relying on staff members whose personal interests and predilections cannot be divorced from what they write. While I am sure everyone at the Journal wants to do a straightforward job of reporting on whether the controlling Bancroft family will sell Dow Jones to Rupert Murdoch or someone else, I also know from my personal experience at a newspaper in play that the process is difficult and emotional for journalists who know the outcome will affect them professionally, personally and maybe even financially. When the Journal started reporting on the story after it was scooped by CNBC, much of the coverage of the unsolicited offer to buy Dow Jones was solid. But things went seriously south in today’s edition. Had this been a story about any other company and any other family, I daresay the Journal would have jumped all over this, likely making it the lead. But, inexplicably, it didn’t. To be fair, we wouldn’t know about any of this, if the Journal hadn’t reported it. Further, there may be valid journalistic reasons – though I can’t think of any – for why the story was constructed in the way it was. While reasonable journalsts may differ, this article underscores why the Journal would do itself and its readers a favor by engaging qualified third parties to cover a story that is likely to continue growing in complexity and sensitivity. That’s what the Seattle Times did in 2002, when it hired veteran journalist Bill Richards to cover the litigation arising from a bitter dispute with the Seattle Post-Intelligencer over the joint operating agreement between the two papers. A former reporter at the Wall Street Journal and Washington Post, Bill was paid a monthly retainer under a three-year contract to dig up everything on the case that he could. Under the agreement, Bill says, the paper either would publish his findings or pay him the balance due on his contract and free him to publish his articles elsewhere. Bill says the paper ran all the stories he produced, including some tough ones. But his contract was not renewed and the beat today is covered by a Times staff writer. More recently, he penned an independent analysis for the Spokane Spokesman-Review on how the newspaper covered a downtown development project in which the family that owns the paper has a significant financial interest. As deep and traumatic as the pending cuts may be in the newsroom of the San Francisco Chronicle, the savings will make only a dent in the growing losses at the increasingly troubled newspaper. When the Chronicle completes the planned termination of 100 members of its 400-person editorial staff by the end of the summer, the resulting headcount will be nearly 35% lower than the 460 journalists working for the paper two years ago. Although the staff reductions will save an estimated $8 million a year in payroll, the amount will cover barely a third of the approximately $25 million that industry experts believe the Chronicle lost in just the first four months of 2007. The operating deficit is significantly higher than the roughly $18 million the paper is believed to have lost in the same period a year ago. The estimated payroll savings are based on the wage scales in the collective-bargaining agreement between the newspaper and the Northern California Media Workers Guild. The escalating deficit at the Chronicle comes on top of the more than $330 million the paper has lost since Hearst Corp. bought it for $600 million in 2000. The purchase price doesn’t count the additional $66 million that Hearst paid a local family to continue publishing its former Bay Area flagship, the San Francisco Examiner, to settle a suit trying to block the Chronicle purchase. Thus, Hearst has invested more than $1 billion in an asset that would be on track to lose $75 million this year, if its current burn rate weren’t arrested. The Chronicle’s losses result from the usual combination of weakening circulation, declining revenues, rising expenses and increased competition for the available advertising in the market from rival traditional and digital media. While most other metro papers are struggling to sustain their typical robust operating margins, the Chronicle is one of the few big-city dailies that actually loses money every day it continues to publish. The Chronicle’s year-to-date deficit of $165,563 per day is roughly equivalent to the annual pay and benefits of two journeyman reporters. If the paper continued losing money at the same rate every day for the rest of the year, it could fire every journalist in the joint and still not break even. With continuing uncontrolled losses of this magnitude, the Chronicle, if it were a standalone company, would be going out of business. The only reason the Chronicle is still around is the continuing forbearance of the Hearst Corp., a family-owned, $7 billion-a-year media conglomerate whose other newspaper, magazine and broadcasting interests are sufficiently profitable to effectively subsidize the struggling newspaper. Controlled by the descendants of buccaneering publisher William Randolph Hearst, the company’s board includes individuals who have deep personal connections to the Bay Area and a pride of ownership in the Chronicle that transcends pure dollars-and-cents analysis. As such, Hearst may continue to support the newspaper indefinitely. Or not. But the deteriorating economics of the business already have encouraged Hearst to take a number of radical steps to restructure it. For one thing, the newspaper has conceded its former circulation dominance in Northern California. Although the Chronicle once boasted the largest circulation in the market, it has slashed its distribution footprint to eliminate unprofitable vanity circulation in distant counties. The paper’s average daily circulation of 387,533 in the six months ended March 30 is a far cry from the pre-Internet era. During my time at the paper between 1984 and 1988, for example, circulation peaked at an average of 618,621 copies per day during the week the pope visited San Francisco in 1987. The Chronicle’s circulation today is less than half that of MediaNews Group, whose nearly 800,000 papers per day encircle it on all sides. In another unprecedented move for an industry infatuated by its thundering presses, the Chronicle has signed an agreement to outsource its production to a third-party printer. The deal will cost 230 unionized press operators their jobs when the new plant opens in 2009. What’s left? Perhaps the sale of the Chronicle’s office building in a once-seedy neighborhood now gentrified by the likes of Nordstrom’s, Bloomingdale’s, a Marriott Hotel and a Sony entertainment complex. If the Chronicle sold this valuable real estate, which no longer contains any production facilities, the down-sized, white-collar work force could be relocated rapidly to a less-elegant part of town. The plans for the Chronicle staff cut were revealed less than a month after a suit brought by a local civic activist scuttled plans by Hearst and MediaNews to collaborate on certain advertising and distribution initiatives. The two publishers hoped to raise revenues and cut expenses through the planned collaboration. With that prospect seemingly off the table, the two publishers may go their separate ways in the Bay Area, notwithstanding their joint publishing investments in other parts of the country. Or, they may consider trying to combine the Chronicle and the MediaNews properties in the type of joint-operating agreement that linked the Chronicle and Examiner until the papers were separated in 2000. A joint operating agreement is a federally sanctioned exception to the antitrust laws that permits competing newspaper companies to combine their ad sales, production and circulation operations while maintaining independent editorial staffs. JOAs, as they are called, are permitted under the Newspaper Preservation Act of 1970, when the petitioning publishers can demonstrate (i) that circulation sales and ad revenues are falling, (ii) that one newspaper has disproportionately less circulation than another and (iii) that at least one of the publishers is losing money. Hearst and MediaNews each participate in JOAs in places like Denver, Detroit and Seattle, so the idea is not alien to them. On the other hand, they just settled a legal challenge to a less-ambitious co-operative venture in Northern California, so they may not want to go down that path again. Because both companies have the financial capacity to stay their present parallel courses, nothing has to happen imminently. If the Chronicle can’t fix its business, however, it seems only fair to conclude that something’s got to give. The folks at the Newspaper Association of America have transcended the bounds of good taste and common decency by adding an online target-practice game to their arsenal of stupid marketing tricks. 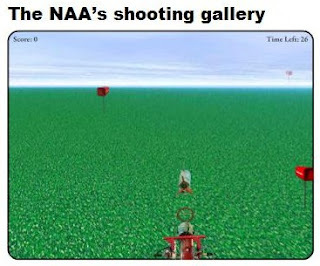 As if the much-ridiculed E.T.-like mascot were not a sufficiently dubious centerpiece for a campaign to promote the newspaper industry, the NAA’s marketing web site now features a shoot-’em-up game reminiscent of the Kill Osama genre that became popular after 9/11. "This is obviously not a campaign targeting consumers in general," says Mort Goldstrom, vice president of advertising at the NAA. "The game was designed to increase both the engagement factor and the fun quotient for advertisers and agency executives, who tend to be twenty-somethings used to engaging with online media in new ways as part of their advertising decision making." Mort says the twenty-somethings have been playing the game so avidly in the first month of its release that it has generated 70% of the traffic drawn to the NAA's promotional web site in all of 2006. But the twenty-somethings apparently have been so busy playing the game that they have forgotten to buy newspaper ads. The Tribune Co., the first company to report April sales results, had an 8.6% drop in revenues from last year -- on top of the generally dismal sales performance suffered by the industry in the first quarter of '007. At a subliminal level, the large number of papers missing their targets seems to belie the idea that this medium hits the spot. At a not-so-subliminal level, I am offended that the campaign glorifies guns when 32 innocents were just shot to death at Virginia Tech – less than 260 miles from the NAA’s front door. The Martin advertising agency, which developed the game, "has a heavy concentration of Virginia Tech graduates, including the twins of our management supervisor," says Mort. None of them, he says, saw the game "as an insensitive insult." Well, I do. This embarrassingly off-target idea needs to be shot down. Now. Struggling to sustain their traditional profitability amid weakening sales, newspaper publishers are looking to outsource everything from composing ads and printing papers to producing content and answering the phones. After nipping and tucking headcount in newsrooms over the last few years, publishers appear to be poised to eliminate a significantly greater number of jobs in their plants by focusing on areas that previously were immune to cutbacks. The initiative likely to claim the largest number of positions in the near future is the outsourcing of advertising composition to places like India and other low-wage countries. In light of the apparent success of a pilot ad-outsource program at the Media News Group properties in Northern California, publishers like Gannett, McClatchy, the New York Times Co. and Scripps are considering whether they, too, should export such duties to offshore vendors, according to insiders familiar with the discussions. These talks may or may not result in a decision to outsource jobs at any given property. But, human costs aside, the economics are powerfully persuasive. Newspapers sending ad production offshore typically can reduce payroll costs by some 45%, says Robert Berkeley, president of Express KCS, one of the outsourcing companies. Thus, a paper could cut its costs to $30,000 a year per outsourced worker from $55,000 for an American doing the same job. These savings are even higher in unionized metro environments, where papers are struggling the hardest to sustain their margins. The Columbus (OH) Dispatch was among the first to shift ad production to India, eliminating 90 jobs from a paper with daily circulation of 231,355. Assuming savings of $25k per employee, the paper should be able to add roughly $2.25 million a year to its bottom line. Putting it another way: If a paper paid each departing employee a generous half-year of severance, the outsourcing project would begin to pay for itself in little more than 12 months – a terrific return on investment. In what may be a harbinger of future initiatives elsewhere in the country, the San Francisco Chronicle has signed a 15-year contract with a Canadian company to begin printing the paper in in a new plant being constructed by early 2009. The opening coincides with the termination of the contract covering the newspaper’s 230 unionized press operators. When the new plant opens, their jobs will be gone. While not outsourcing their production altogether, companies like the New York Times, Gannett, Media News and Journal Register have consolidated the printing and mailroom operations among certain of their geographically contiguous properties. In New Jersey, 200 production positions were eliminated when Advance Publications opened a plant to combine the production of the Newark Star Ledger and the Trenton Times. While outsourcing production is complicated and not always feasible, the easiest jobs to shift are those of the people who work in telephone rooms or perform accounting, billing, accounts payable, human resources and other clerical functions. Many newspaper groups already funnel want-ad and circulation calls to regional or national centers, where a single group of workers serving multiple time zones is far more efficient than a team dedicated to a single market. Many chains also have either consolidated clerical functions at in-house service bureaus or outsourced them to domestic vendors. Sending call-center and clerical work offshore can shave 25% to 30% off the present costs of such operations, according to Gartner Research, a private firm. The New York Times and Boston Globe, among others, are each sending 40 to 50 clerical jobs to offshore contactors. Even editorial and online operations are not immune from outsourcing. Knight Ridder had a plan to create regional copy desks to handle headlines and layouts for groups of newspapers, a concept that was shelved prior to the sale of the company last year. Preposterous as the idea might sound, this is exactly what is being implemented in New Zealand by the publisher of the country’s largest daily and several other publications. APN News and Media, a division of Britain’s Independent News & Media, is outsourcing about 70 jobs to an Australian company, according to Deutsche Presse-Agentur. If it works well, Independent News may extend the program to its titles in England and Ireland. Reuters has more than 300 journalists in India writing many of the routine stories on its financial wires, according to MediaGuardian. Reuters has said it may increase the size of the Indian staff to 1,500 writers, though this could be affected by the potential merger with Thomson Corp.
And today's Los Angeles Times reports that a hyper-local website in Pasadena (not affiliated with a newspaper) has hired two writers in India, who, among other things, will cover city council meetings via webcam. As valuable as Internet operations are to the future of newspaper companies, some publishers are having at least a portion of the work done overseas. London’s Financial Times, for example, relies on a staff in the Philippines to help edit and maintain its web site. With offshore development, testing, hosting and technical support common in the information-technology sector, it is only logical that newspapers could achieve additional economies by moving – or expanding – many of these functions abroad. When everything from designing buildings to analyzing X-rays can be performed by lower-paid professionals in another part of the world, there’s no reason to believe newspapers can avoid the workforce shake-ups that have jolted most other industries. Institutional inertia and economic self-satisfaction have maintained the status quo until now. As an increasingly challenging business environment forces newspapers out of their comfort zones, many dedicated workers, unfortunately, will be forced out of theirs, too. Editors trawling for good stories should take a look at the Chicago Sun-Times, which just exposed a bunch of sushi bars peddling phony fish. Unless things have changed a lot since I left my hometown 24 years ago, I doubt raw fish has supplanted such major Chicago food groups as deep-dish pizza and Vienna hot dogs. So, sushi seems a slightly odd investigative target. But the S-T is on the right track in seeking weak links in the food chain, given the tainted spinach, hamburger, dog food and other detestable comestibles that seem to be coming to light at a quickening pace. The fake-fish story has been making the rounds among television news shops since 2004, according to Therion International, a private laboratory that specializes in genetic testing for animals. The Sun-Times and St. Petersburg Times are among the few newspapers that have taken it on. But this sort of reporting is well overdue. Although a certain number of citizens in every community doubtless are concerned about the arcane workings of the library board or the subtle political machinations at their state legislature, that group is dwarfed by the number of people who eat two or three times a day. Or drink water. Or breathe the air. Newspapers seeking greater relevance in their communities would do well to emulate the Sun-Times by focusing their investigative resources on the sorts of subjects people care about. Why not analyze a different food product each week? Or run a regular log of restaurant inspections? How about randomly testing the water supply at various taps around the community? Checking noise levels? Monitoring air pollution? In the meantime, readers hankering for sushi are urged to exercise extreme caution until local editors can validate their dinner’s pedigree. To be on the safe side, I would recommend the California roll. Because it's usually made with fake crab, diners can be sure of getting the genuine article. Staffers and readers worried that Rupert Murdoch might ruin the good name of the Wall Street Journal already have been betrayed by the editor who sat on the story of the $5.5 billion bid for their company. The embarrassment seemed acute enough when CNBC last week broke the news that News Corp. was offering to buy Dow Jones, the parent of such ordinarily intrepid financial news organizations as the Journal, Barron’s and MarketWatch. But the back story, as reported today in the New York Times, was far worse. A few days after Murdoch offered secretly to buy DJ on April 17, he sent Managing Editor Paul Steiger a “Personal and Confidential” email “offering his reassurances that he would uphold the editorial integrity of The Journal if he were successful,” according to the Times. Paul decided sit on the blockbuster news, instead of pursuing it with the vigorous effort that doubtless would have been triggered by any other “Personal and Confidential” email from any other CEO wanting to buy any other company. A well-regarded editor who heretofore has led his staff with distinction, Paul told the Times that he went silent because he didn’t want to betray Rupert’s confidence. Sorry, but this doesn’t wash.
An editor properly doing his or her job will come into contact with newsmakers involved in all aspects of community life. It is altogether fitting and appropriate that editors and newsmakers may discuss any number of of potentially newsworthy topics. People who talk with editors know full well who they are and what they do. They shouldn't say anything to editors that they don't want to see in print. Most newsmakers actually love access to editors, hoping they can can use the relationship to spin coverage in their preferred direction. But some newsmakers try to innoculate themselves from coverage by telling an editor something in confidence that they don't want to see in print. That's evidently what Murdoch did in this case. Paul shouldn't have let him get away with it, espcially since the "confidential" email evidently arrived unsolicited and without the sort of prior agreement that a reporter might give a whistleblower providing key information for a sensitive story. Paul admittedly was put in a tough position by Murdoch. But any editor worth his salt should have found a way to put his staff onto the story without revealing his confidential knowledge. As long as the story had been developed independently through third-party sources, Paul would have been ethically in the clear with Rupert, his staff and his readers. Instead, Paul is heading into his previously scheduled retirement this month with a most unsavory episode punctuating an otherwise distinguished career. The irony in this case is that there was a simple solution to Paul’s ethical dilemma. All he had to do was ask one of his sub-editors to look into the unusual frenzy of trading in Dow Jones options that began in the middle of April. Had they done so, the reporters would have discovered that their own company was in play. And they also might have unearthed the alleged insider-trading case that's sure to produce some interesting reading in the months ahead. The Thomson Corp. wouldn’t be in a position to take a run at Reuters if Roy Thomson didn’t have the gumption to buy the tiny Timmins Press in 1934 – and his heirs didn’t have the foresight 66 years later to get the heck out of the newspaper business. Thomson, which has emerged as the not-so-secret suitor for Reuters, was the fourth-largest publisher of newspapers in the United States when it stunned the industry in 2000 by announcing plans to sell 55 daily papers, 75 non-daily papers and 400 other specialty properties. At the same time Thomson was peddling its papers, the Tribune Co. paid twice the trading price of stock of the Times-Mirror Co. to buy it for $8 billion – or $3 billion more than the combined companies are worth today. Hearst, meanwhile, was stretching to acquire the San Francisco Chronicle for $600 million-plus, a deal it may have come to rue. The Chronicle's cumulative losses since then are estimated to be in the nine figures – and still climbing. Thomson’s wholesale departure from publishing was the logical result of the company’s decision in the late-1970s to begin acquiring and building specialized, premium-priced information services for the finance, legal and scientific communities. Newspapers represented only 14% of the company’s total sales of $6 billion by the time Thomson decided to jettison its print properties in Canada and the United States. Whether by luck, intuition or a little of both, Thomson’s management recognized far earlier than any other traditional publisher that electronic delivery would usurp print as the preferred medium for delivering valuable financial data and searchable databases of legal opinions or medical research. They evidently didn't envision Google, MySpace or YouTube, but nobody's perfect. When Thomson finished selling its publishing portfolio to such companies as Gannett and the predecessor of Gatehouse, it banked nearly $3 billion at an average price of 12.8 times earnings before interest, taxes, depreciation and amortization (EBITDA). This compares with the average value of the public newspaper companies today of a bit more than 10x EBITDA. For a few years after the newspaper divestiture, Thomson retained a 20% stake in the prestigious Toronto Globe & Mail. But sentiment went only so far and Thomson sold its remaining stake in its former flagship in 2003. Thomson’s journey is an inspiring, and important, lesson for the mainstream media companies struggling with the changing fundamentals of the modern world. Publishers need to recognize that the core capabilities of their franchises are not their ability to manufacture a particular type of product called a newspaper but, rather, their strengths as content producers, audience builders and marketing organizations – regardless of the medium. Now, the journey will continue with Thomson going after an international financial-publishing empire that got its start delivering dispatches via carrier pigeon. With Rupert Murdoch apparently just a couple percentage points shy of inking the deal for Dow Jones, he might consider wafting a little extra cash under the noses of the Bancroft family to get it done. Hard as it may be to believe, it’s considered perfectly kosher in Delaware, the Promised Land for corporations, for an acquirer to pay a premium price to acquire the type of supervoting shares that stand between Murdoch and the $5.5 billion object of his desire. Murdoch appears to be thisclose, as they say on his Page Six, to snaring a deal to buy DJ. Although roughly 80% of the family’s votes reportedly remain opposed to Murdoch’s offer, he would have 48% of the votes of the entire company if all the common shareholders favored a sale. In that event, Murdoch would need to recruit less than 5% more of the family’s shares to put this one to bed. And that’s why he might consider offering extra cash to just the family shareholders, an incentive that is neither novel nor unprecedented in the annals of big-league deal making. John Malone and his inner circle got an extra 10% for their vote-rich shares of Tele-Communications Inc. when AT&T bought his company for $59.9 billion in 1999. Although the ordinary stockholders filed suit over the $376 million premium shared by the cable baron and his fellow supervoters, the $52 million settlement eventually shelled out by the uber-investors was little more than a nuisance fee to a guy who single-handedly grossed more than $2 billion as his share of transaction. Notwithstanding the TCI case (which was complicated by a few ancillary matters), the Delaware courts subsequently have ruled that there’s nothing wrong with slipping a few extra shekels to the controlling stockholders. “Put simply, pure ‘control premium-envy’ is not a cognizable claim for a minority stockholder,” the Delaware Chancery Court ruled last year. It’s only fair, the court stated, that “controlling stockholders, who are subject to the risks associated with holding a concentrated position, may receive a premium for their stock over that paid for any other stockholders’ shares,” according to a summary of the case by O’Melveny & Myers, a New York law firm. There’s no way to know if the supervoters are in line for a bonus at Dow Jones – or whether this tactic some day could figure in the fates of such similarly structured companies as the New York Times and Washington Post. But it’s always amusing to contemplate the many ways the rich can get richer.